CCRT Training to Teachers, CCRT is organizing an Integrating Crafts Skills in School Education, CCRT Orientation Courses to Teachers, CCRT Teachers Training Programme on Integrating Crafts Skills in School Education and Our Cultural Diversity. CCRT Training Programmes/ Orientation Courses Schedule and Venue. 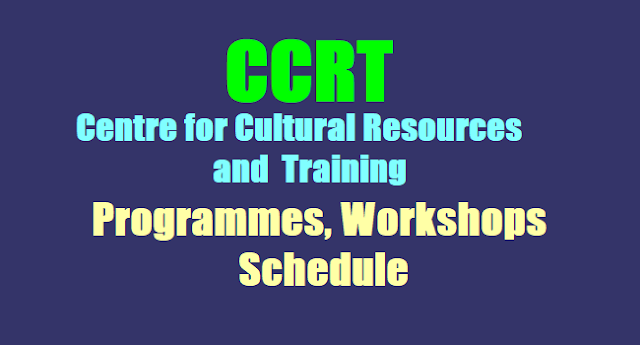 CCRT Programmes to Teachers, Teacher educators, Students, Schools. Rc.No.77, Dated:26-09-2017: Sub: School Education - Centre for Cultural Resources and Training (CCRT) - Training programmes offered by the CCRT, New Delhi from September to December, 2017 - Deputation of Teachers - Orders issued - Reg. The attention of the all the District Educational Officers in the State are invited to the references read above and informed that the CCRT trainings programmes schedule for the year 2017-18 was already communicated under reference 2"d cited and they were requested to depute the Teachers to attend the CCRT training programmes as per schedule under intimation to this office. But, no information has been received till today, in spite of number of reminders under reference 3rd to 6th cited. Further, the Director, CCRT, New Delhi has sent the schedule from September to December, 2017 under reference 7th cited regarding the workshops to be organized by the CCRT which was also communicated to all the DEOs in the State under reference cited, and requested to depute Teachers for participation in the workshops to be organized by the CCRT, New Delhi. Again, the Director, CCRT, New Delhi has sent a letter under reference 9th cited and requested to depute 10 Teachers for participation in the workshops to be organized during the months of October to December, 2017. The workshops schedule is already communicated to all the DEOs in the State for the months of October to December, 2017 under reference 8th cited. Therefore, the all the DEOs in the State are once again requested to depute two (2) Teachers from each District as per the schedule communicated by this vide ref-8 cited to the CCRT programmes under intimation to this office without fail. Rc.No.77, Dated:11-09-2017:: Sub: School Education - Centre for Cultural Resources and Training (CCRT) - Training programmes offered by the CCRT, New Delhi from September to December, 2017 - Deputation of Teachers - Orders issued - Reg. The attention of the all the District Educational Officers in the State are invited to the references read above and informed that the CCRT trainings programmes schedule for the year 2017-18 is already communicated under reference 2nd cited and they were requested to depute the Teachers to attend the CCRT training programmes as per schedule under intimation to this office. But, no information is received till today, in spite of number of reminders under reference 3rd to 6111 cited. Further, the Director, CCRT, New Delhi has sent the schedule from September to December, 2017 under reference i11 cited regarding the workshops to be organized by the CCRT. The workshops schedule is annexed with this proceedings. Therefore, the all the DEOs in the State are requested to make note of the above programmes and to take necessary action to depute two (2) Teachers per District for CCRT workshops as per schedule without fail under intimation to this office immediately.